I hope you all are having a great week so far! 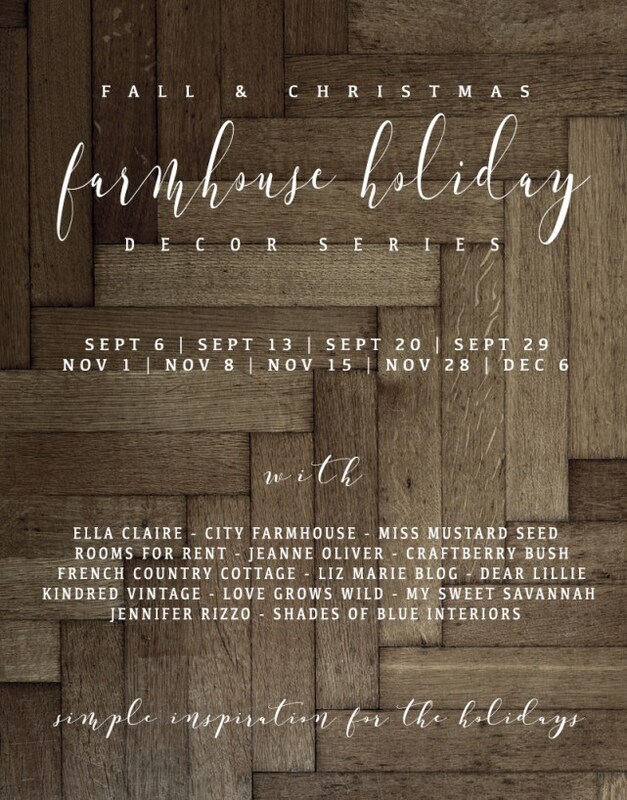 We are excited to be back with lots of our favorite blogging friends for the second Christmas installment of the Farmhouse Holiday Series! 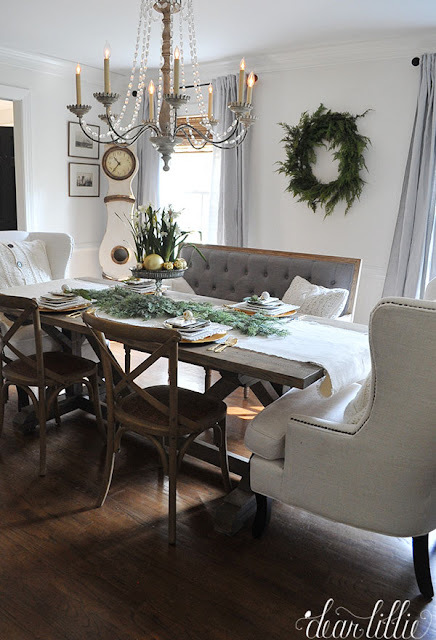 This week we are sharing our dining rooms! And for this post we partnered with HomeGoods and you have a chance to win a $100 gift card (you can enter at the bottom of this post). 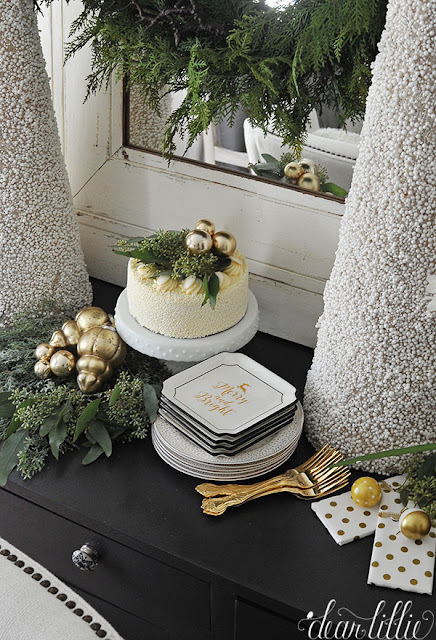 This year we decided to stick with a soft white and gold color scheme with lot of greenery thrown in. 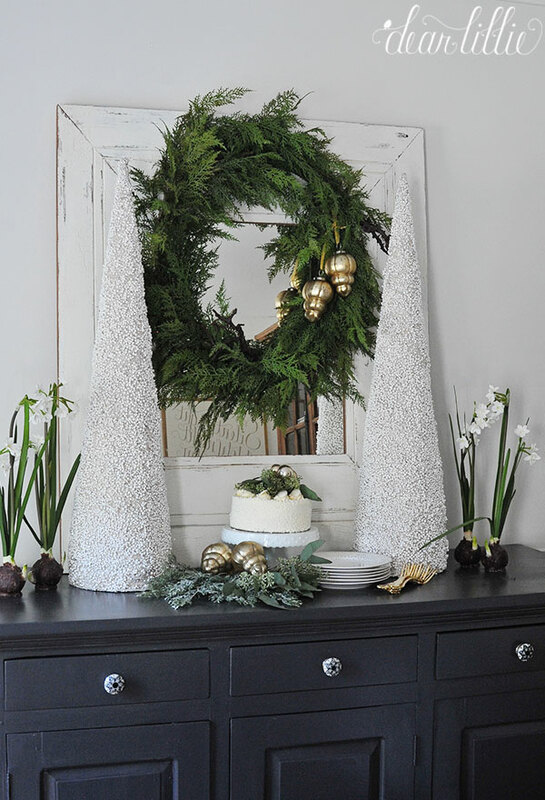 On our sideboard we found this tall white cone covered with white beads at HomeGoods and then added a faux wreath that we've had for several years (it was from a local store that is now closed, unfortunately). We added some pretty gold ornaments to the wreath for a simple touch. 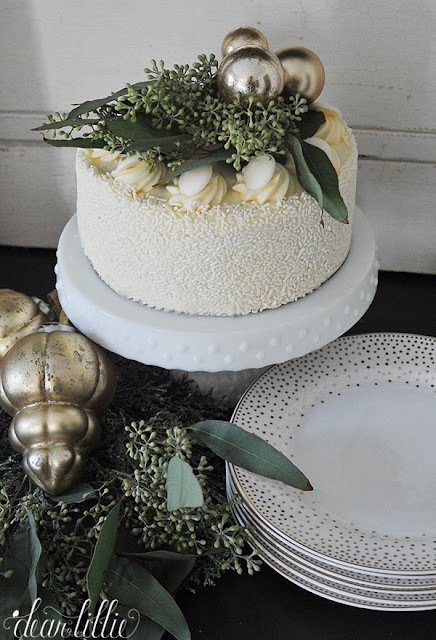 Then we added a yummy vanilla cake that we topped with some fresh seeded eucalyptus and some miniature gold ornaments and set it on a milk glass cake stand we found at HomeGoods as well. For the table setting we mixed some gold chargers, beautiful gold plates and fun Merry and Bright plates all from HomeGoods with some of our existing white beaded plates. I love mixing and matching plates! 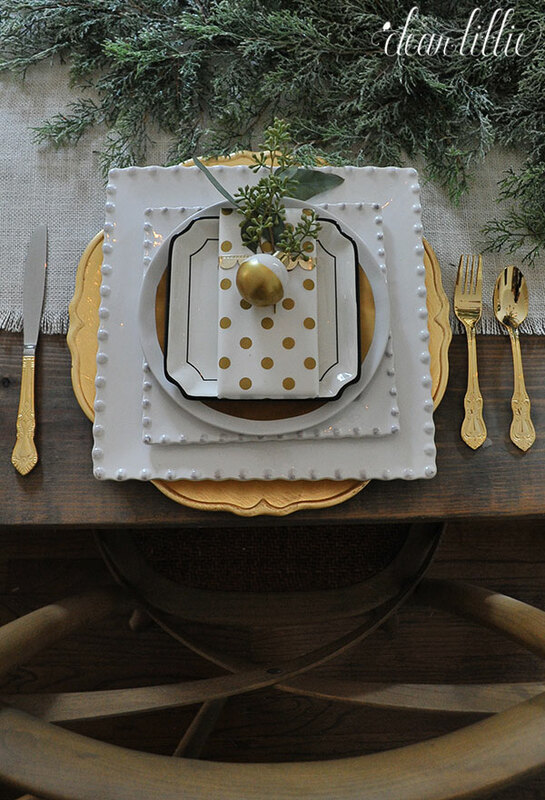 I also love these gold dotted plates and ornaments that we found at Homegoods as well. Our Silent Night Painted Wood Sign will be available in our shop tomorrow morning at 10 EST! 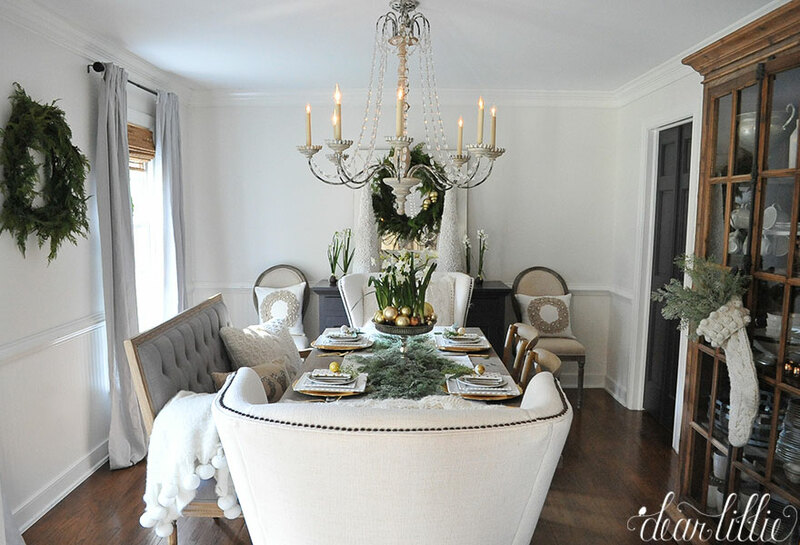 Beautiful dining room and lovely decor ideas! Absolutely stunning! Decor is classy and very relaxing. I love it! So beautiful....ahhh. I would never leave my home if I were you! It is so gorgeous, peaceful and calm.. just what we need in our stressful lives. Thank you for your inspiration. 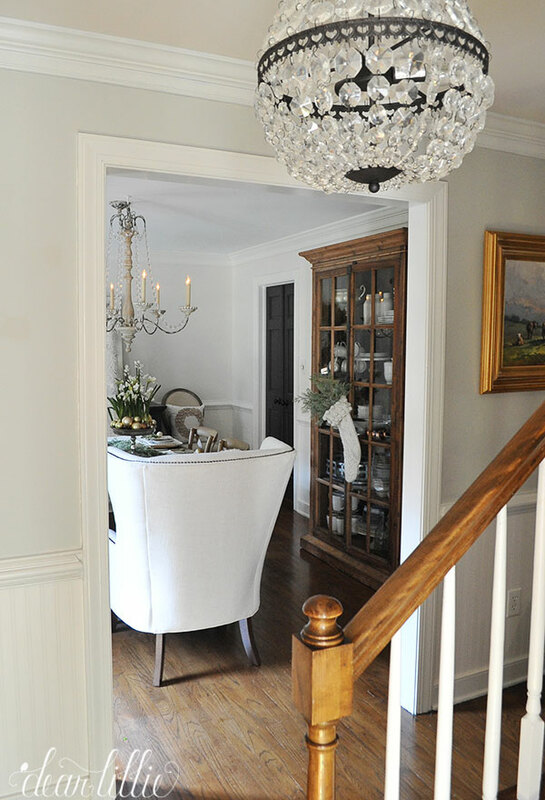 Your dining room looks beautiful! Thank you for the giveaway. I love home goods! This is all so beautiful! Thank you for the giveaway too! Home Goods is the best! Wonderful post! I love going to HomeGoods to pick out Christmas decor. What beautiful holiday decor! 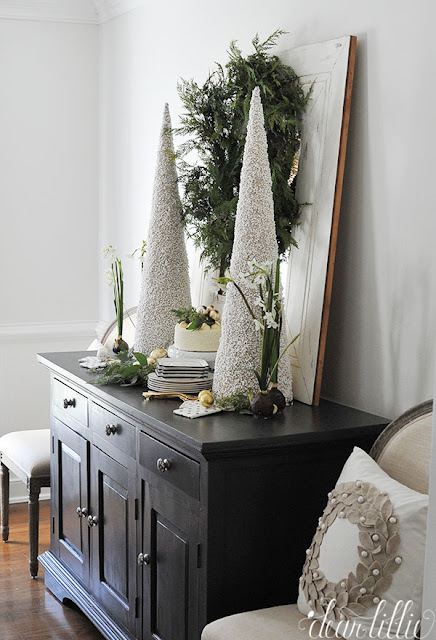 I cannot wait to decorate for the holidays! This is so beautiful! I love Homegoods, it's my go to for pretty much everything in my house. Thank you for the chance at the giveaway! I absolutely love that chandelier! Thanks for lovely inspiration. I'm always drawn to your simple and chic designs! 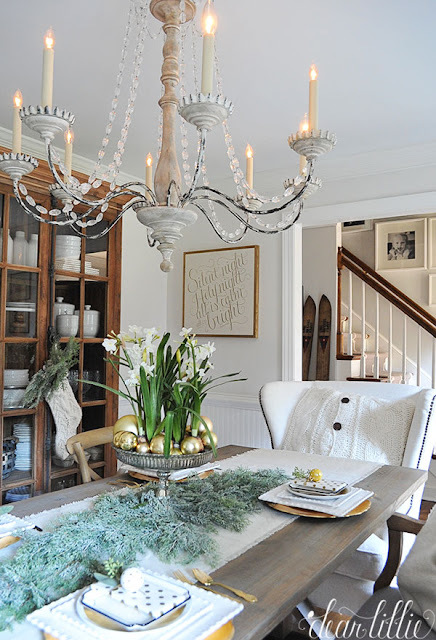 Your home is always my go-to for decor inspiration! Love it!! Gorgeous. I sure love that hobnail cake plate. I love the gold accents. Beautiful. Thanks for sharing-and for the chance to win! I love Home Goods!so many great items to give as gifts! You always so such a beautiful job and Christmas is no different. I'm inspired to do a few of your ideas. I love Home Goods in fact I think I’m going there tomorrow they have the best price on coffee k cups. I think I would like some new holiday decorations this year maybe just an upgrade on the same old stuff I have been using the last 10 years and the gift card would go a long way at home goods. Would love to sit down at that table for dinner. Absolutely the best tablescape. I love HomeGoods! They have everything I need for changing my home decor. Oh how pretty! I love the white and gold! I really love the gold flatwear. I have been trying to find some for myself. LOVE your dining room. Love the cake plate and white cones and the vanilla cake looks yummy...I love everything in your dining room !!! 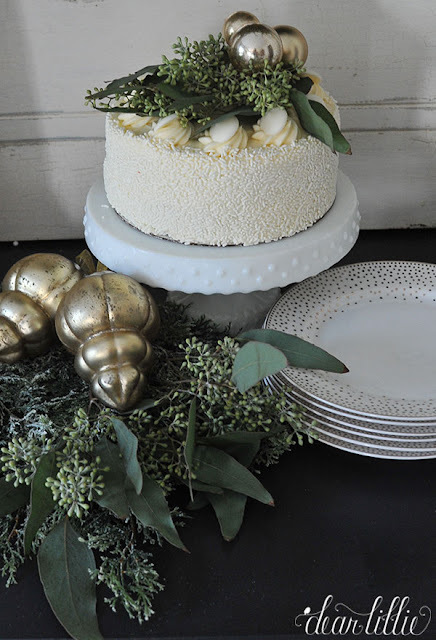 I love those plates and the cake looks yummy. Beautiful space! 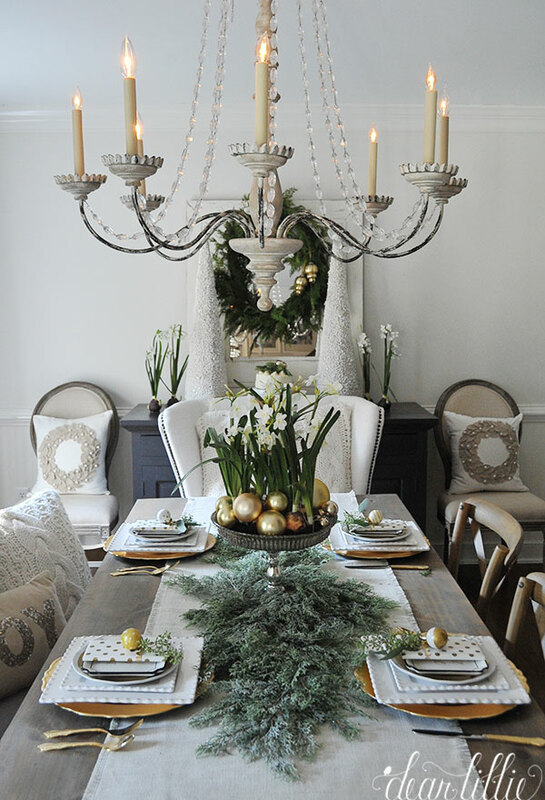 Inspirational and the fresh greenery is perfect! Your home is so calming and lovely. 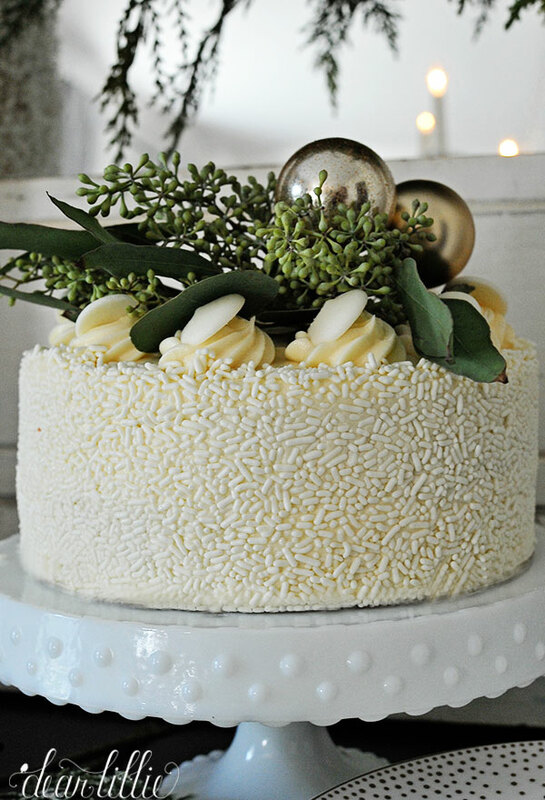 Your cake is beyond stunning! I love it. I needed these pretty pictures to cheer me up tonight as I am watching the returns. 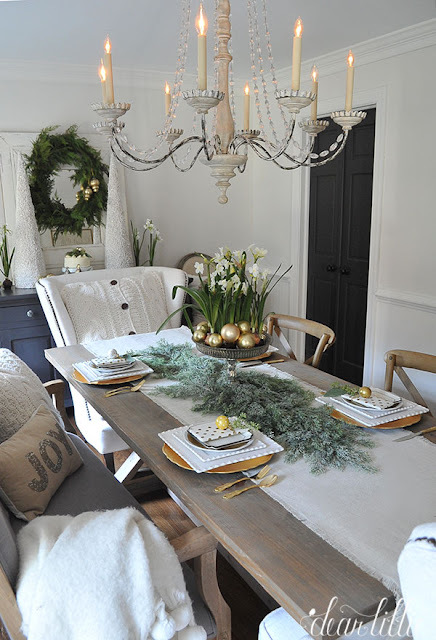 So ready to get into the holiday spirit- love everything about the tablescape! Awesome textures. I want to be fancy and elegant! Everything you do is absolutely beautiful. The decorations are beautiful but now I just want that cake. So many nice things makes for a stunning presentation, and also warm and inviting. Wow! I love your table setup! Thanks for the ideas and the giveaway! I love how you styled the table! It's so classic and clean and festive. Really lovely and soothing color combinations! 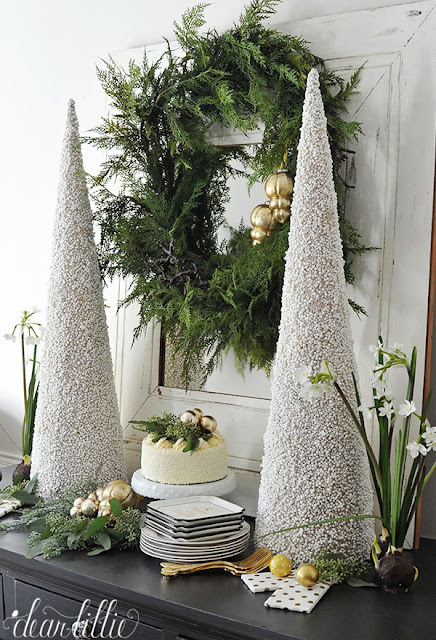 Love the touches of greenery. Thanks for sharing with us! 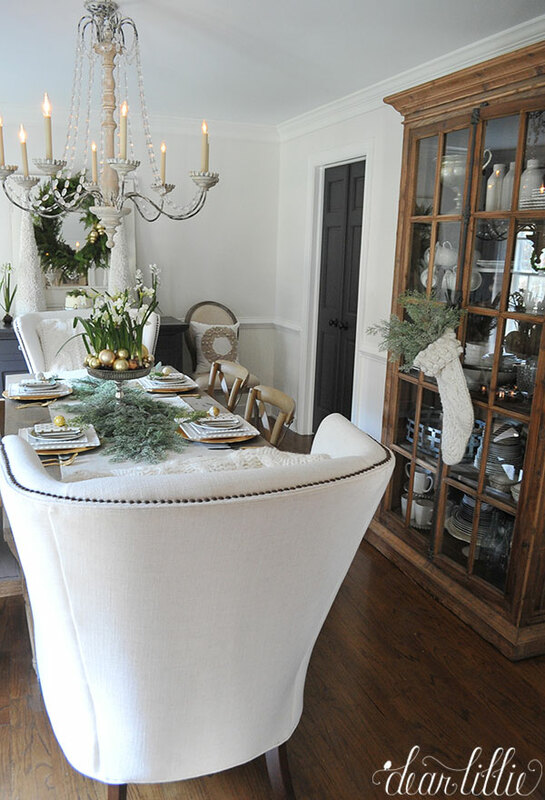 Fabulous dining room! I love the clean look of the white. I always get a smile on my face when I see you have a post to share! And then I feel like I am back in school as I just have to study every.little.detail. Absolutely stunning beautiful pictures. I love it all. Oh that is so beautiful for the holidays! 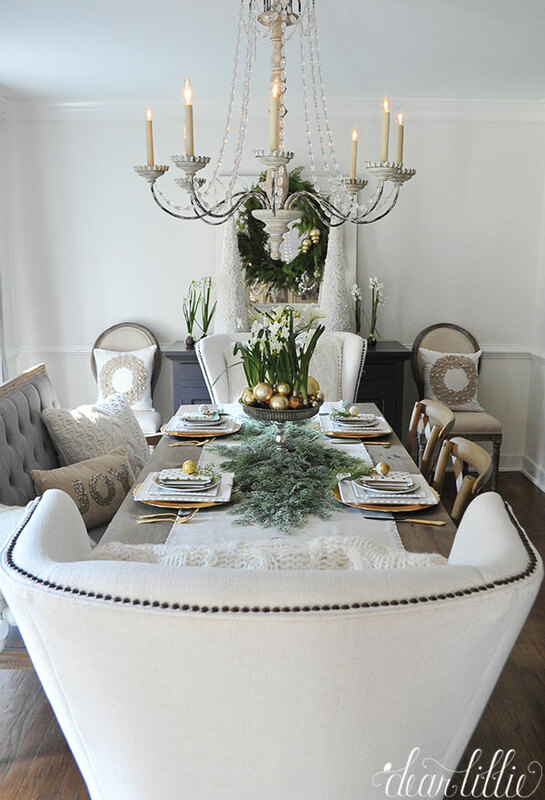 We always have family come to town for Christmas, it would be so fun to create something like that for our Christmas dinner! I have never been there before, I really need to go and check it out. They really have neat things there! I was at Home goods yesterday, they already have some great Holiday decorating items. 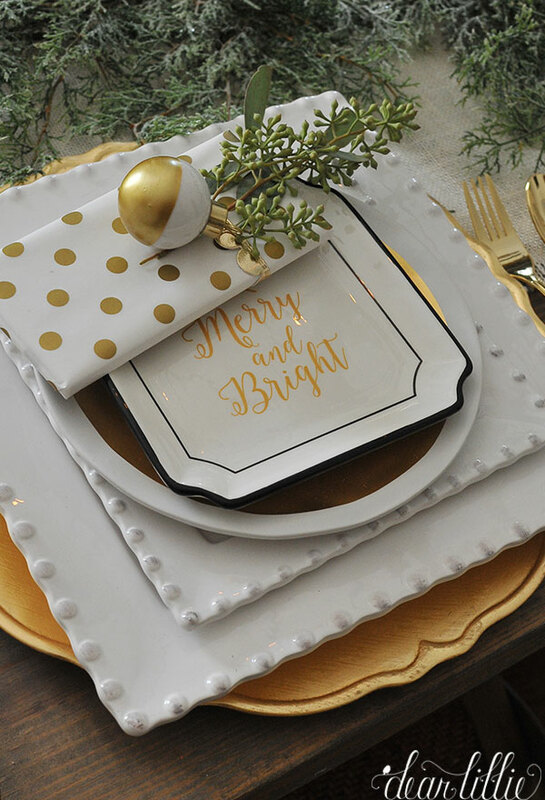 The Merry & Bright plates make me smile!! Love your decor! Can't go into Home Goods without purchasing something! Love your decor! Can't shop Home Goods without making a purchase. Such fun finds for the home! 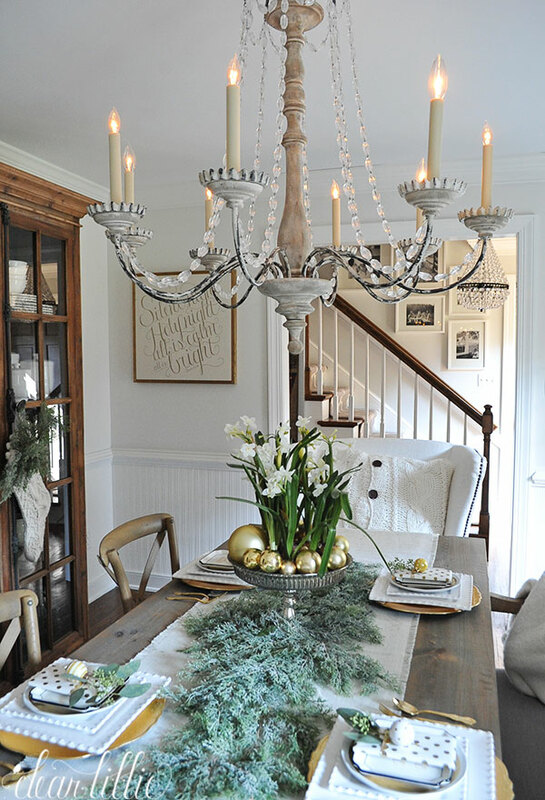 Love your christmas style! So inviting! 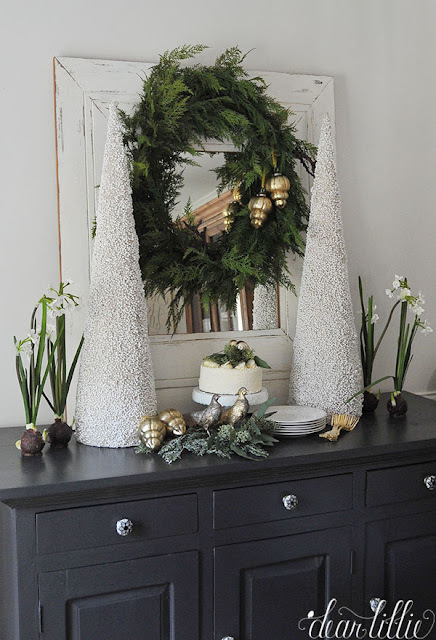 Love the way you used greenery and would love a gift card to home goods. I love how you mixed all the textures. It seems very inviting. 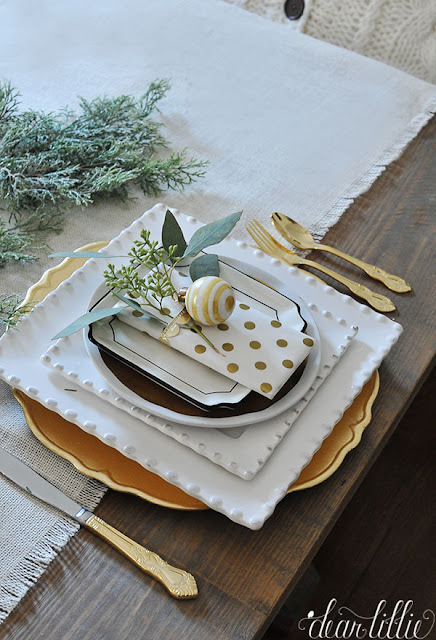 I love all the pretty designs that can be repurposed throughout the year, like the gold dots. It's wintery and beautiful, but doesn't have to be taken down Dec 26! I simply love all your posts but this one is exceptional. 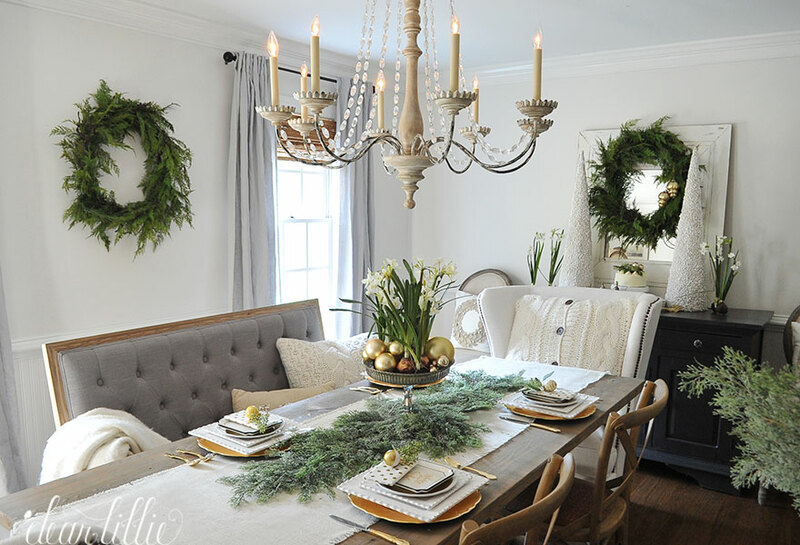 Your dining room is very pretty. Love the mix of green and white with gold accents. Very elegant. Can you give me a source for your dining room chandelier as it appears that Savvy is no longer in business.